On Friday night, heavyweight Chazz Witherspoon beat down a game Charles Davis in just over six rounds in the scheduled eight-round main event of a lively card at the Blue Horizon. The show was branded "The Night of the Undefeated" and all three of the local loss-less boxers - Witherspoon, Max Alexander & Chucky Cavallo - kept their "0's" intact. The sold-out crowd cheered wildly for the TKOs scored by Witherspoon & Cavallo, and booed just as wildly for the six-round stink out pitched by Alexander. Charles Davis entered the Blue Horizon ring looking very much the lamb headed for slaughter by local favorite and Philly boxing royal family member Chazz With-erspoon. He appeared small for his opponent and you could tell that the crowd gave him not little, but no chance. Davis would prove however, that he came to fight. 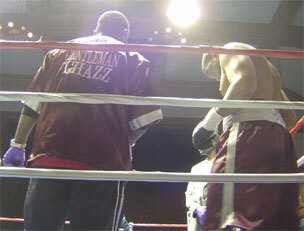 Chazz entered the ring the picture of calm, hooded in burgundy. There really is something regal about this guy. It is too early to say whether he can become a champion, but he seems to be ready to take on the role. 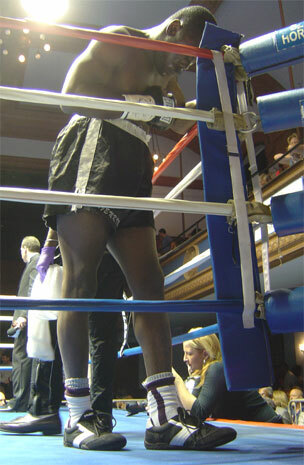 At the opening bell, Witherspoon the workman took control of the bout using a nice jab and a variety of snappy shots. But Davis didn't come to lie down. He surprised Chazz and the Blue Horizon mob with sneaky and solid punches. In the third, a sharp right by Davis landed and Witherspoon's head snapped back, producing a geyser-spray of sweat and a loud "woo" from the crowd. As Chazz methodically jabbed and moved forward, Davis dropped two hard lefts right on the button. Witherspoon walked through them, but lost the round. 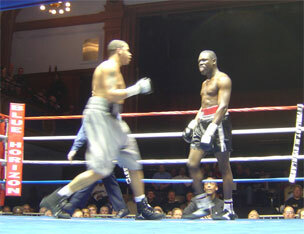 In the fourth, Chazz started wearing Davis down and finally put him on the canvas with a left hook near the end of the round. Davis faced more heavy pressure in round five. In the following, round Witherspoon dropped Davis for the second time and it looked like the end of the road. But Davis got up survived the remaining seconds and even made it out for round seven. The two met in center ring and Witherspoon went to work. Before you knew it, Davis knelt down and referee Steve Smoger stopped it. The time was 19 seconds of round seven. In the semi-windup, Camden's Max Alexander put in a vintage performance which drew long and loud "boos" from his own crowd. Alexander is a puzzle. His tall, rangy, slick, left-handed, skilled, and charismatic. But this guy seems to enjoy stinking out a venue. I've seen him look exciting at times, but usually his fights are excruciating - if you like action. If your thing is a sly feint or a slipped punch with a smile & wink attached then you will be on your feet at a Max Alexander fight. Having said that, I really like him. I like to watch him. Maybe I am waiting - and hoping - that he'll break out and transform into a fighter with something more than promise. On this night, he faced Demetrius Jenkins, a very experienced customer from Detroit who came into the ring wearing thread-bare trunks on their last leg. He looked like a hard-boiled road warrior and that is exactly what he proved to be. Jenkins pressed the action and even shook Max up in round one. Maybe this early hard shot by Jenkins reminded Alexander of the pole-axe Marty Lindquist nailed him with last October and sent him on the move. Who knows? From that point on it was all Max Alexander but he fights like disappearing ink. How does he win so big doing so little? Around the third round, the crowd cast their vote with thunderous boos. Max just smirked and carried on. To be fair, it seems that Alexander injured his left hand during the fight. Afterward he said that it was broken. I had him winning all but one of the six rounds. 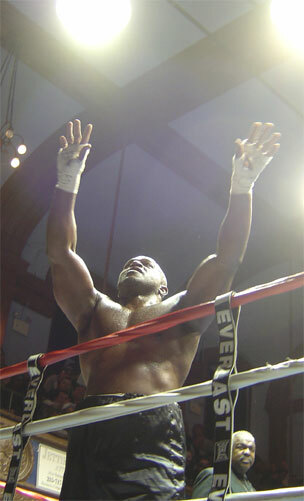 The judges agreed and gave Alexander the unanimous decision in the over-the-weight light heavyweight fight. Alexander raised his record to 14-0-1 with 1 No Decision and 2 KOs. Jenkins dropped to 21-15-1, with 16 KOs. On the way out the door, Max was sporting a bandaged hand. In another over the weight light heavy-weight fight, undefeated Chucky Cavallo, Trenton, stayed that way with a fourth round TKO of Mike Word of Milwaukee. Cavallo, sporting a new pile of wavy brown curls on his head, started a sustained attack in round one and kept going. He almost floored his for in round two but Word kept chugging and occasionally landed some sneaky shots. Round three was a big one for Cavallo as he battered Word and bloodied his nose. In the fourth, as Cavallo punished Word, Smoger kept taking close looks, apparently ready to stop it. Word made it through the round but the fight was stopped by his corner before the fifth. The win made Chucky C 14-0 with 5 KOs. Word dropped to 4-8-3 (4 KO). In a junior welterweight six rounder, "The Kosher Pit Bull", Elad Shmouel took a unanimous decision in his fight with Jason Jordan of Akron, and raised his record to 17-1 (8 KO). Shmouel is from Tel Aviv but is training in and fighting out of Philadelphia these days. Jordan dropped to 3-7-2. In a heavyweight clash scheduled for four rounds, Mark "Oak Tree" Brown took on yet another Brown in "Sgt." Sam Brown of Ft. Campbell, KY. The fight was like two trucks colliding on Rt. 95. The sweat and spit was flying as the two waded in. Oak Tree, looking more muscular than ever, landed loud shots to the body and thumping rights to the head. In round three, Sgt. Sam was dumped on the canvas. Although he rose, the bout was essentially over. After getting trapped in a corner and taking several hard shots, Ref Steve Smoger stopped it on Brown's behalf. The time was 1:28. Oak Tree, of Salem, NJ, went to 9-1 (4 KO). The other Brown fell to 3-2. In the opening bout of the night, Slick Simon O'Donnell, the pride of Galway Ireland, extended his young undefeated streak to 4-0 (3 KO) with a four round unanimous decision over Philly's wild swinging Joe Christy in a middleweight fight. 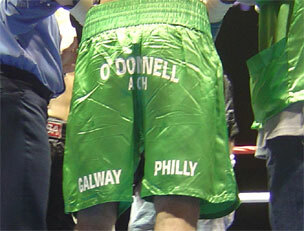 Baby faced O'Donnell looked like a gloved Jimmy Olsen in brilliant green trunks as he pitched a shut out over his foe. All three judges scored it 40-36 for the Irishman. 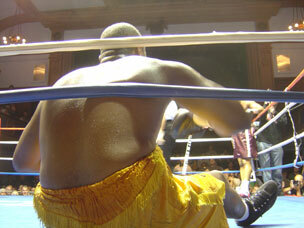 A sold out crowd of approximately 1,200 attended the fight held on Good Friday 2007. In attendance was Steve Cunningham, Terence Cauthen, Randall "Tex" Cobb, Charles Brewer, Harry Joe Yorgey, Richard Stewart, Simon Carr, and NBC-10's Jade McCarthy.